Now this is more like it! This is new Linq by Incipio. This great looking strap incases the iPod nano 6G into Incipio's Next Generation Polymer material housing for maximum comfort and durability. The nylon strap secures by velcro and is interchangeable. This probably won't be the last strap/case combination for the iPod nano 6G we will see, as more and more companies begin making accessories for the iPod nano. Incipio really stepped up the game with their Linq, now I actually want me a nano! The Linq will be available five colors. No price or available date announced as of yet. 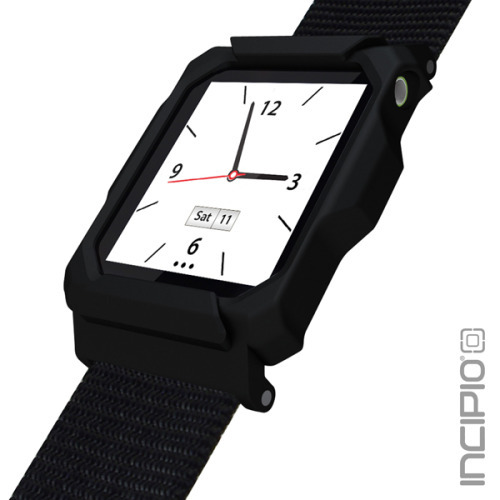 Update: Incipio has announced that the Linq is expected to be available starting early October for $24.99 and $9.99 for each additional nylon band.